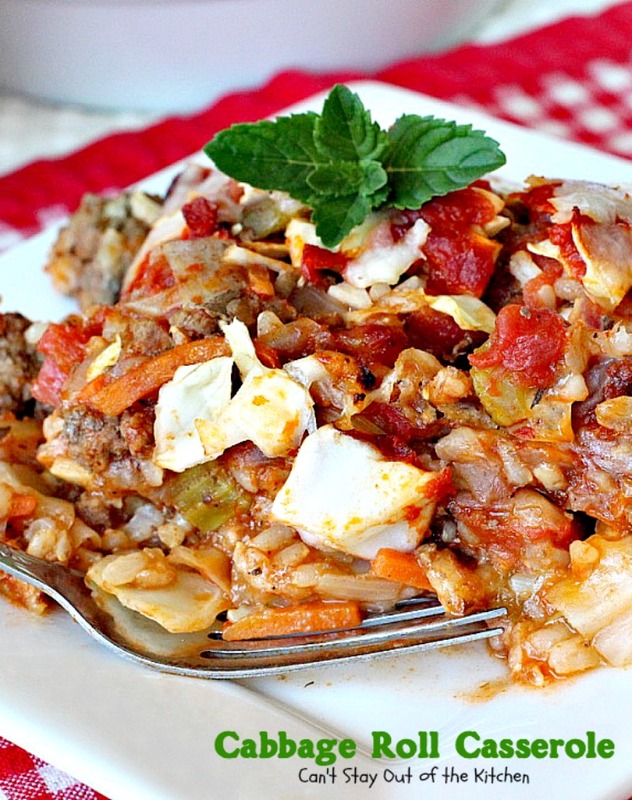 Oh, heavenly day, Cabbage Roll Casserole is absolutely outstanding! 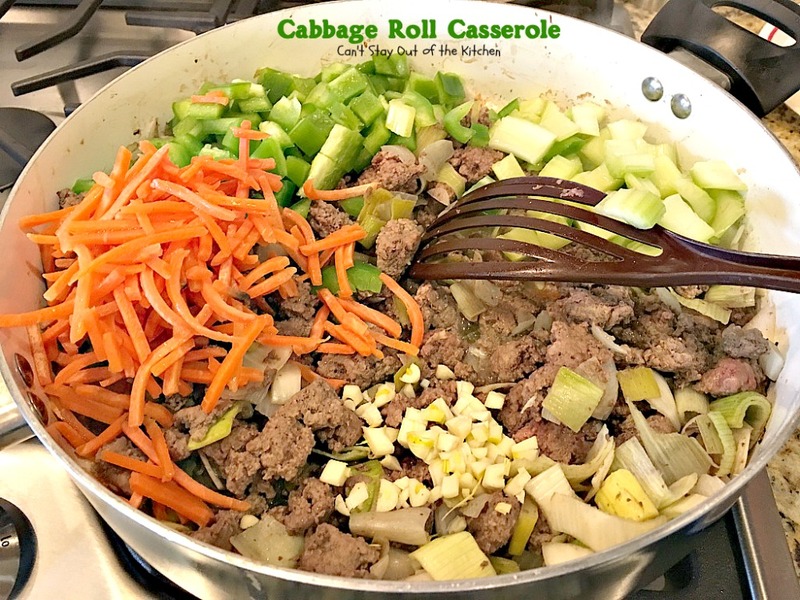 If you’re a cabbage lover like me, this is a great way to get your veggies as the beef and rice mixture also includes celery, carrots, green peppers, leeks, tomatoes, onions, garlic and bacon. 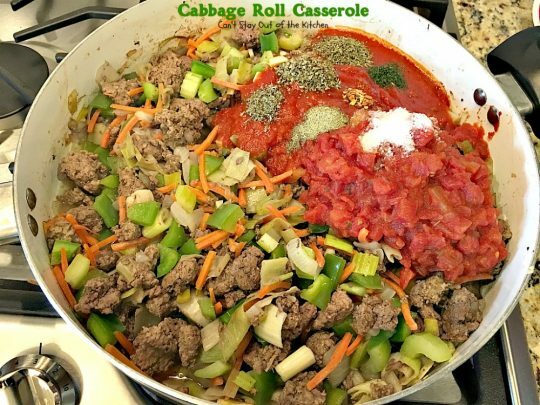 Instead of wrapping the stuffing in cabbage leaves, this one layers the beef mixture with the shredded cabbage and then a jar of spaghetti sauce is poured over top. 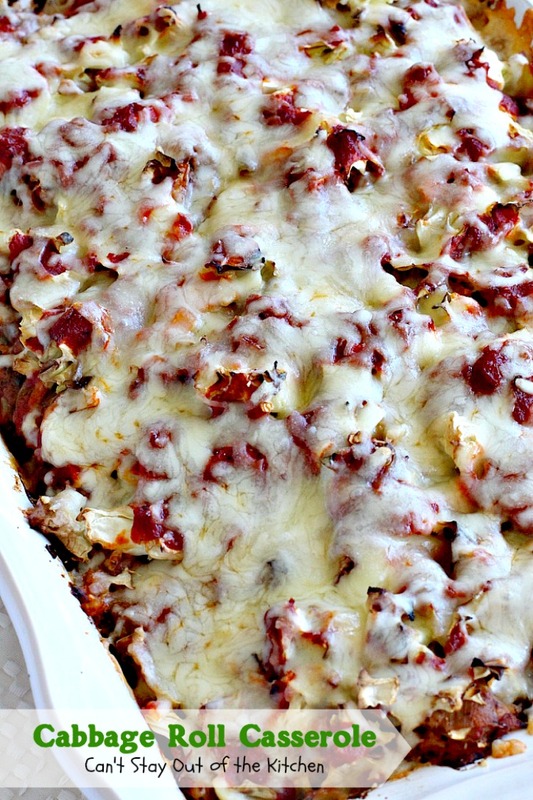 After baking, the casserole is topped with Mozzarella and Monterey Jack cheeses for even more deliciousness. Oh, my. All I can say is I wanted to keep eating this over and over and over again. And I did! My husband is not overly fond of cabbage. Which is a shame because I love it. 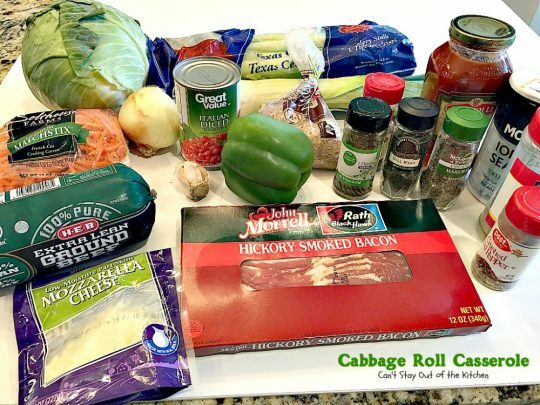 So he will eat one meal with cabbage in a recipe and after that I’m on my own (or I send the dish to friends). Hey, he doesn’t like Guacamole either which blows my mind. 🙂 When I can, I try to eat an avocado every day. This delectable entree is gluten free and about as clean-eating as I could make it. But you can choose a nitrate-free, sugar-free bacon at Sprouts or other healthy food stores to increase the health of this dish. Ok, back to cabbage. John’s grandma used to have us over for dinner every Thursday night for dinner the first several years of our marriage (before children came along). 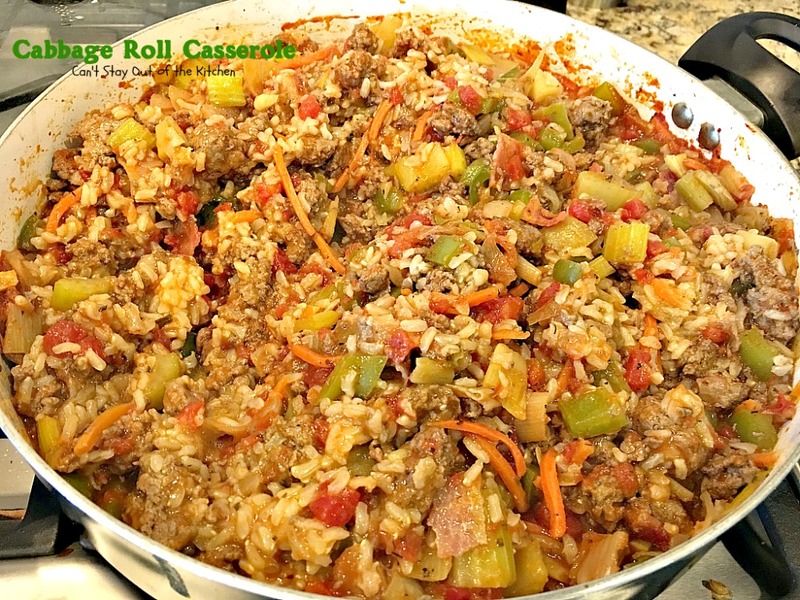 One of the things she used to make regularly was Stuffed Cabbage Rolls. Grandpa was of German descent so she made this frequently for him when he was alive. Grandma always improvised with what she had on hand. And since she almost always included celery and carrots, I’ve included it here. She also used both diced tomatoes and spaghetti sauce which is a little different than the traditional recipe, but I’ve always liked it that way. While she used Minute Rice, I prefer using a good brown rice or wild rice. She would even include bacon on occasion and other tasty stuff, so I added it. I’ve always liked leeks added to just about anything, so I’ve included leeks for the wonderful, savory flavor they add. On top of that I’ve included several delicious herbs that season this recipe wonderfully. 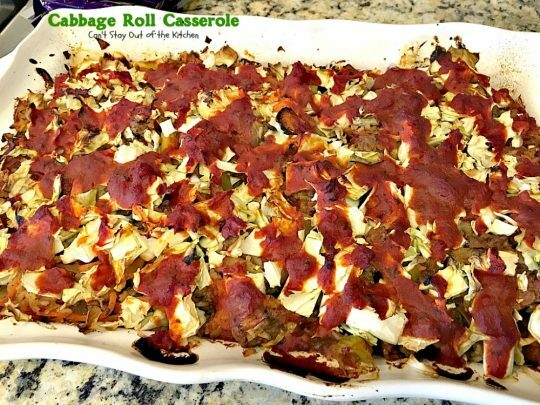 If you really want the full effect of this delicious recipe, go out and get ALL the ingredients, including seasonings. Otherwise, you’ll short-change yourself on flavor, texture and the delightfulness of this excellent entree. Cabbage Roll Casserole is a scrumptious new take on Grandma’s delicious Stuffed Cabbage Rolls that I think you’ll really enjoy. It does require some work to get it prepared, but once it’s in the oven you are almost home free. Bacon, Mozzarella and Monterey Jack cheeses and soaking the rice before cooking make this casserole extra special good. If you enjoy old-timey recipes with old-fashioned goodness, I think you’ll be coming back for more of Cabbage Roll Casserole. Enjoy. 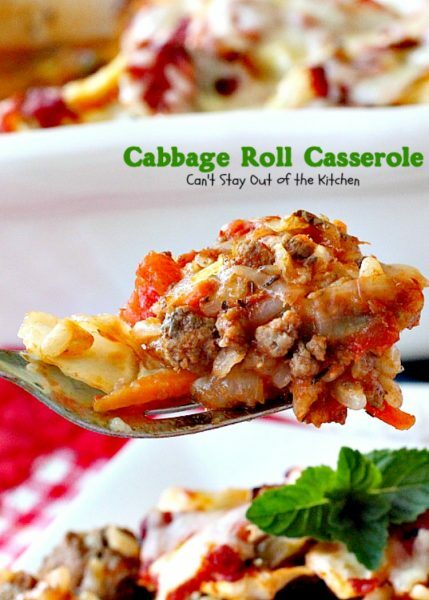 Cabbage Roll Casserole is phenomenal. Your taste buds will be delighted with every bite of this entree. 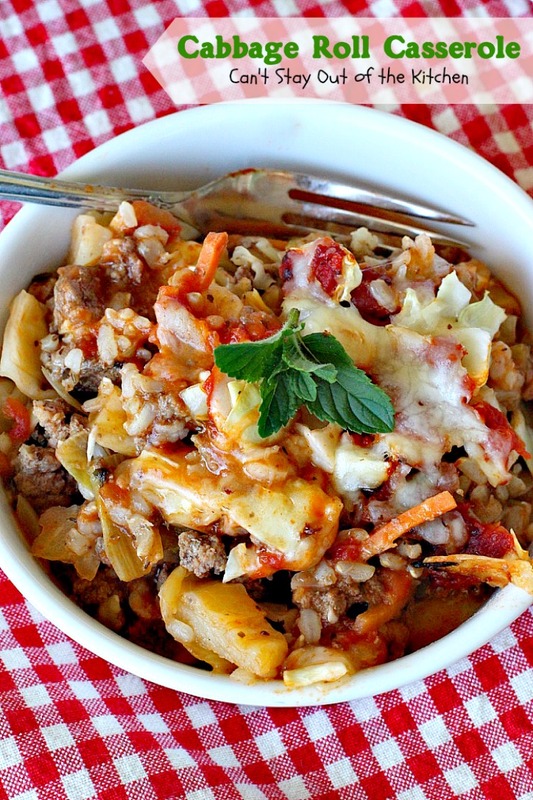 If you’re looking for a great comfort food, then you need to give Cabbage Roll Casserole a try. The tomatoes, cheeses, and bacon pack a powerful punch that makes this casserole irresistible. I had a hard time stopping. I just wanted to keep eating this stuff as it was so good. I used these ingredients plus Monterey Jack cheese. 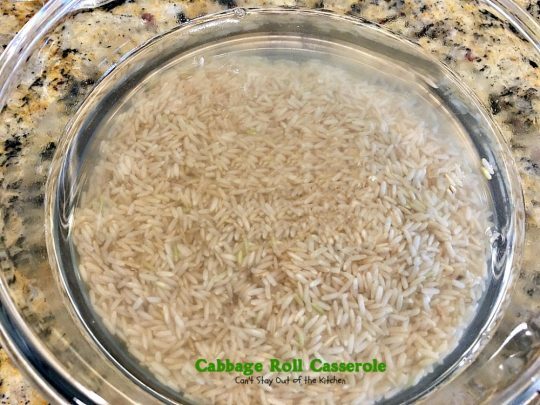 If you have time before you get started, soak the rice in water for an hour or two. This removes the harmful phthalates in the rice and makes for nice plump cooked rice that’s easier to digest. Brown ground beef. Add leeks and onions and saute until veggies are tender. Add green pepper, carrots, celery and garlic and saute about 5 minutes or until veggies are tender. Add diced tomatoes, half of the spaghetti sauce and seasonings. Stir to combine. Cover with lid. Bring mixture to a boil and simmer about 5-10 minutes. 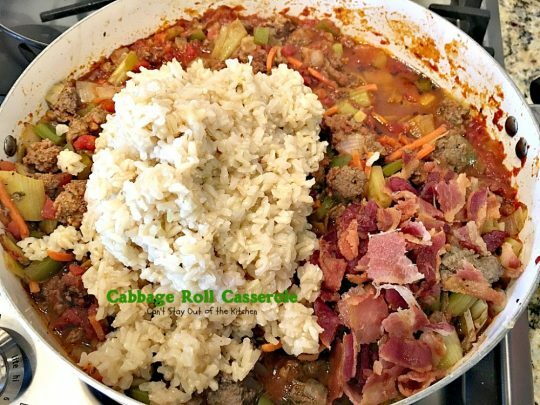 Add cooked rice and cooked bacon. Stir to combine. Heat through. Remove from heat and set aside. Meanwhile, as beef mixture is cooking, shred cabbage. Grease a 9×13″ glass baking dish. Sprinkle 1/3 of the cabbage in bottom of dish. Top with half of the meat mixture and 1/3 of the cabbage. Top with remaining beef mixture and remaining cabbage. 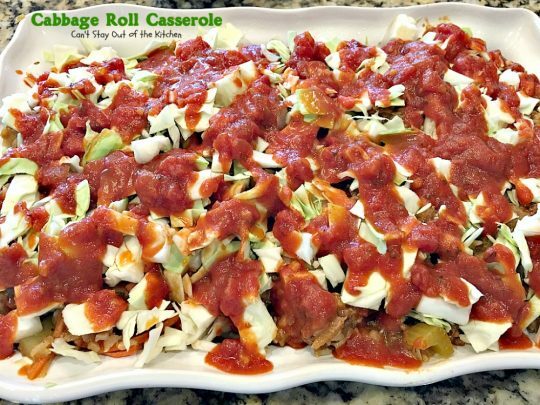 Drizzle remaining spaghetti sauce over top of cabbage. Bake at 375 about 45 minutes. 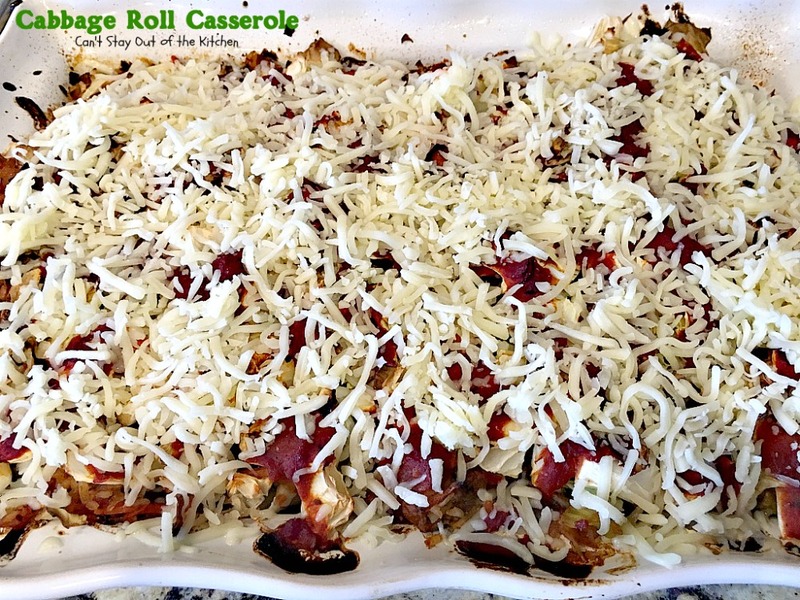 Remove from oven and sprinkle with Mozzarella and Monterey Jack cheeses. Bake an additional 5-10 minutes until cheese melts. Allow casserole to sit about 5 minutes before serving. This is a great way to get your kids to eat their veggies. Plus, it’s really a healthier, more clean-eating recipe than many! This amazing entree is filled with cabbage, beef, rice, all kinds of veggies, bacon and two cheeses. It's a delightful way to enjoy Stuffed Cabbage Rolls without quite so much work. Gluten free. 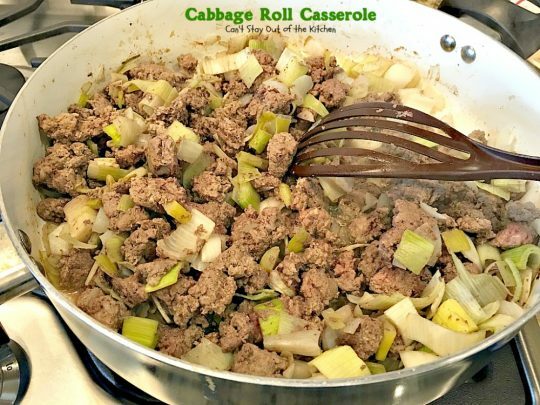 In large skillet, brown beef, leeks and onion over medium heat, until beef is no longer pink. Add carrots, bell pepper, celery and garlic and cook a few minutes longer. Add half of the spaghetti sauce, diced tomatoes and seasonings. Cover with lid and bring mixture to a boil. 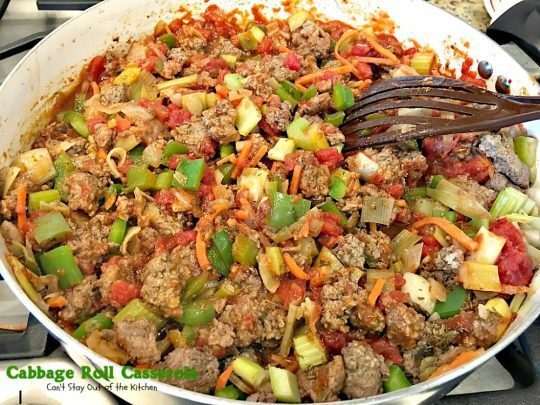 Reduce heat and simmer about 5-10 minutes, until veggies are fork tender. Add bacon and rice and stir to combine. Grease a 9x13” glass baking dish. 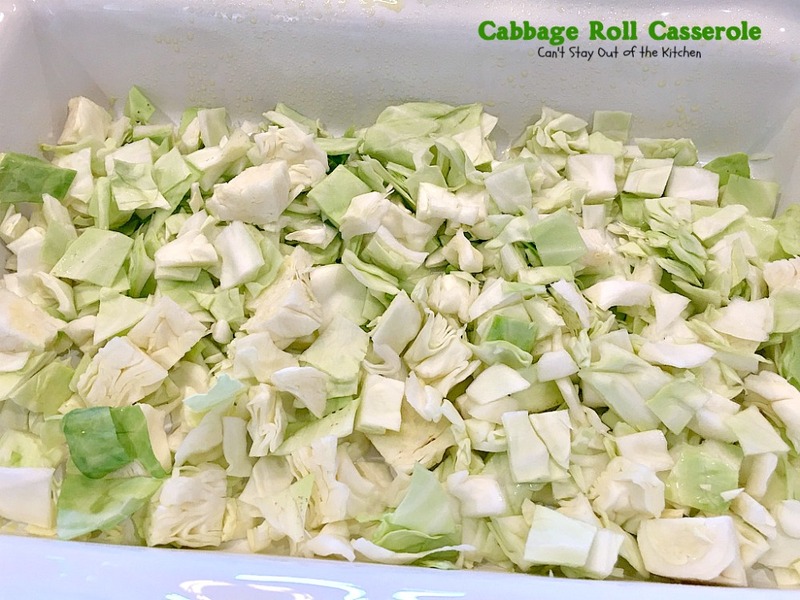 Layer one-third of the cabbage in bottom of dish. Add half of the beef/rice mixture. 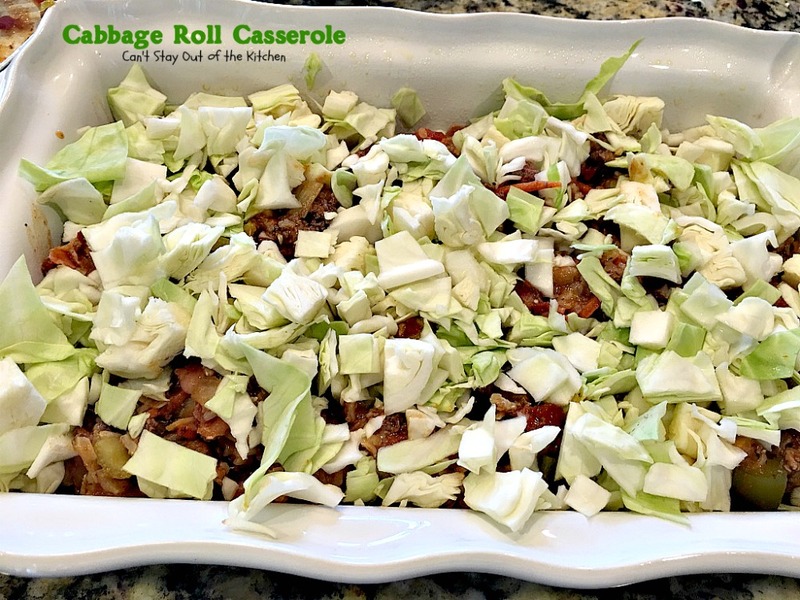 Layer with another third of the shredded cabbage. Pour remaining beef mixture over top. 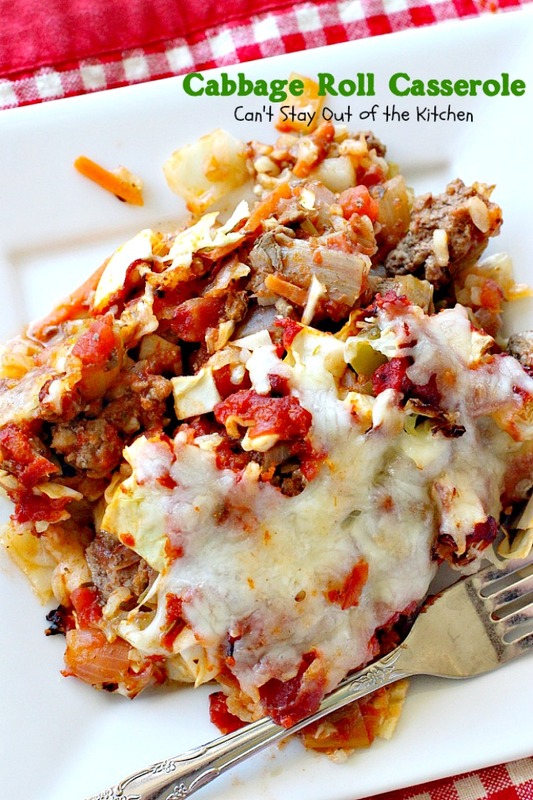 Sprinkle remaining cabbage over top and pour remaining spaghetti sauce over top of cabbage. 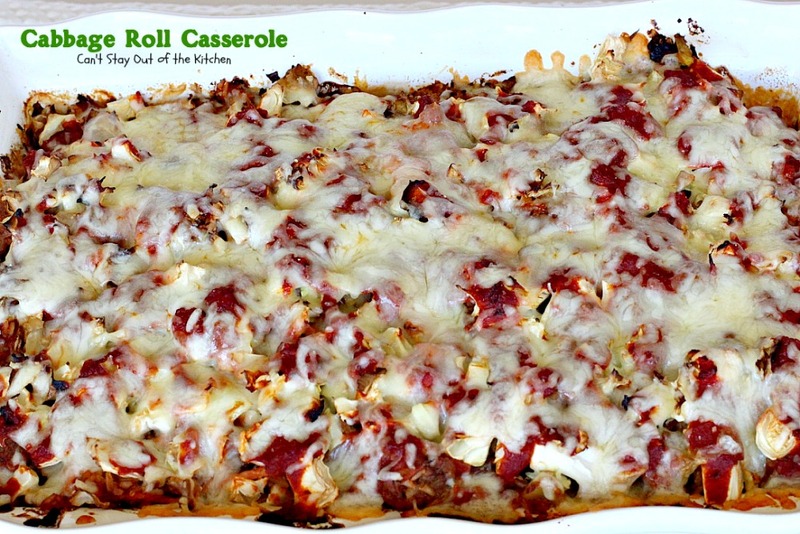 Bake at 375° about 45 minutes until casserole is bubbly and heated through. Sprinkle mozzarella & Monterey cheeses over top. Bake until cheese is melted, about 10 minutes longer. Remove from oven and allow casserole to sit 5 minutes to set up before serving. NOTE: If desired, soak 1 cup rice in 3 cups water for 1-2 hours before cooking. 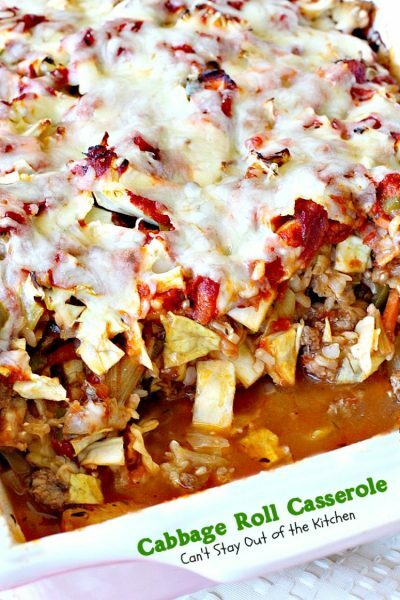 This amazing entree is filled with cabbage, beef, rice, all kinds of veggies, bacon and two cheeses. It’s a delightful way to enjoy Stuffed Cabbage Rolls without quite so much work. Gluten free. Grease a 9×13” glass baking dish. If desired, soak 1 cup rice in 3 cups water for 1-2 hours before cooking. 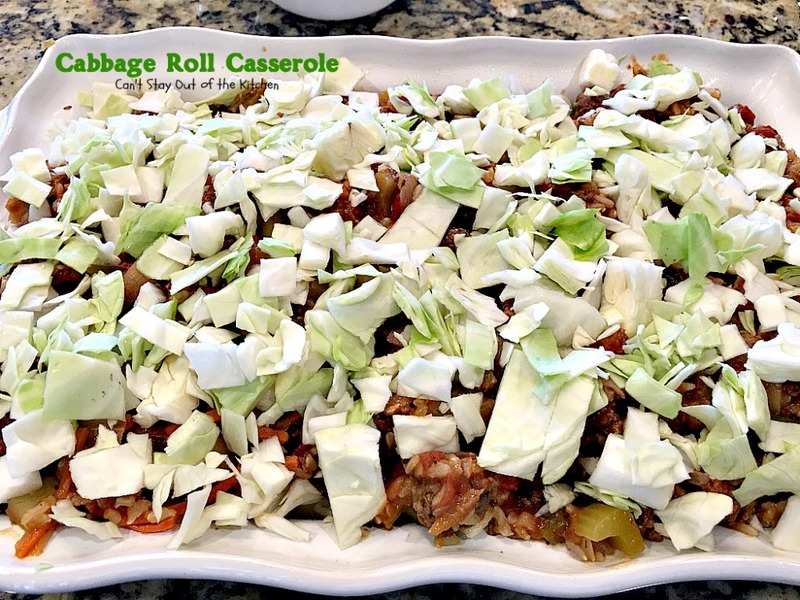 Cabbage Roll Casserole makes 12 large servings. 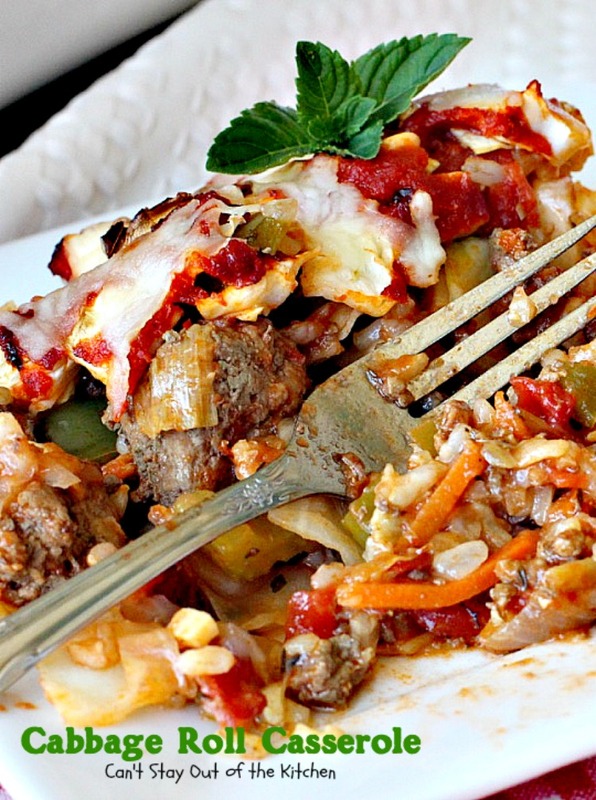 It makes a great dish to serve for company and the leftovers heat up wonderfully. Monterey Jack and Mozzarella cheeses add a delicious gooeyness to this recipe. Oh, I hope you make it Shari. It was sooooo, so good. We loved it.